LTP of excitatory synapses on hypocretin/orexin neurons following an acute exposure to prolonged wakefulness. 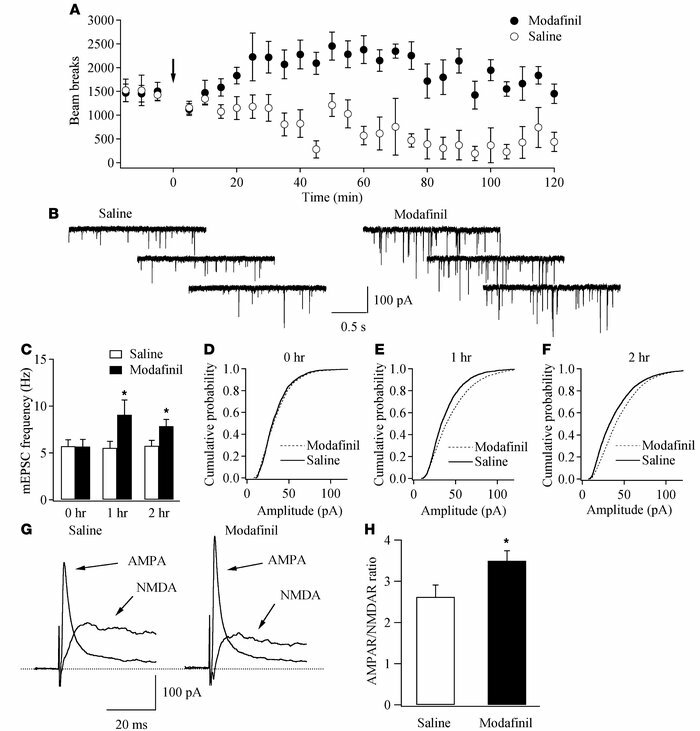 (A) Modafinil (100 mg/kg) induces a long-lasting increment of locomotor activity in mice. Each point represents averaged beam breaks within a block of 5 minutes from all animals in each group during our experiments. The arrow indicates injection of modafinil or saline. (B) Sample traces of mEPSCs recorded in hypocretin/orexin neurons from saline- and modafinil-treated mice. (C) Mean frequency of mEPSCs recorded in hypocretin/orexin neurons 0, 1, and 2 hours after the injection of saline or modafinil. *P < 0.05, Student’s t test. (D–F) Cumulative probability of the amplitude of mEPSCs recorded in all neurons from saline- and modafinil-treated mice 0, 1, and 2 hours after the injection. (D) Saline, 1,518 events; modafinil, 1,557 events. (E) Saline, 4,510 events; modafinil, 2,753 events. (F) Saline, 3,250 events; modafinil, 3,942 events. (G and H) Relative contributions of AMPARs and NMDARs on evoked EPSCs recorded in hypocretin/orexin neurons from mice treated with saline and modafinil. (G) Sample traces of evoked EPSCs carried by AMPARs and NMDARs in hypocretin/orexin neurons from mice treated with saline (left) and modafinil (right). (H) Pooled data of the AMPAR/NMDAR ratio from all neurons in saline- (n = 10) or modafinil-treated mice (n = 10) 1 hour after the injection. *P < 0.05, Student’s t test.